If I were to ask what would be the first word of a Filipino kid, some might say "Mama", while others would say "Dada". However, when it comes to food and character recognition, I guess we would all agree that every single Filipino kid can immediately recognize that happy orange bee otherwise known as Jollibee. In my 27 years of existence, I have never seen a kid who's face did not light up upon the mere mention of Chicken Joy or Spaghetti. How they would cling to every single word of Tito Aga (Muhlach) as he bites into that crispy-licious Chicken Joy on tv. I brace myself knowing that someday I will have to deal with and eventually might give in to the constant pleas of my future kids as they insist on having Jollibee for dinner and nothing else. Indeed, Jollibee has played a big role in our lives from the time that they launched the Regular Yum Burger to everyone's guilty indulgence, the Chicken Joy, and later on launching more and more delicious treats to suit the Filipino taste. Growing up, I was and continues to be a fan of the Jolly Hotdog and the Palabok Fiesta. How sad my mom and I were when they pulled out the Palabok Fiesta for a time and how I happily surprised her again with it when they brought it back. This year, Jollibee continues to innovate and delight our senses by launching the Jollibee Chicken Barbecue. Over lunch today, I was given the chance to have a taste of this delicious new product. I loved the tender two-piece chicken meat that is not so sweet nor was it too salty. It has a perfect barbecue flavor which I feel is pretty similar to another childhood favorite, Alex III's Chicken Barbecue. The Java Rice was pretty mild that I feel would have been better if it was given more flavor and aroma. Nonetheless I appreciate the fact that they gave us a separate cup filled with extra barbecue sauce that allows you to adjust depending on your taste. Being known to offer langhap-sarap meals that are friendly on the pocket, the new Jollibee Chicken Barbecue is available as a 1-piece solo meal for only Php. 69 or the 2-piece solo meal for only Php. 119. However, I highly recommend that you get the value meal as this comes complete with a regular-sized drink. The 1-piece value meal is at Php. 89 while the 2-piece value meal is at Php. 139. 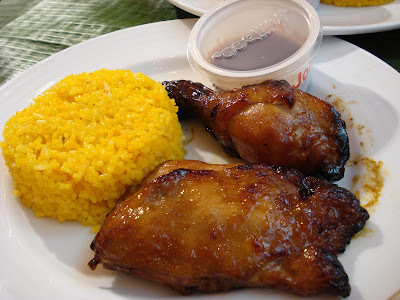 Currently, the Chicken Barbecue is only available in Metro Manila but will soon be hitting the provinces as well. I liked the chicken, but not so much for the java rice. Check out the chicken bbq promo I found on facebook! not that tasty. like an ordinary chicken barbecue you can buy at a corner stall. Only with fancy packaging.